Thanks to our partner Traveling Mom and to Dana Zucker and Sherry Wernicke founders of Moms Good Eats for the amazing guest article on travel tips! Wouldn’t it be nice if you always had the time to plan vacations way in advance? Wouldn’t it also be nice if you didn’t NEED a quick getaway after a horrible or exhausting week? Well, if you’re like us, life intervenes and that’s exactly why the quick getaway was invented. Create an adult only or a family affair; they just need a bit different planning. When we decide it’s time for a quick family getaway, even on short notice, it doesn’t mean some planning hasn’t gone into the process. We’ve taken quite a few of these quick getaways over the years, so we have them down pat. We know what to look for when making the decision that will make the trip easy and fun for the whole family. We also know the importance of getting away for a short trip. These getaways can be exciting and recharge everyone’s batteries, including the kids’, for the week ahead. And, hey, sometimes travel spontaneity is really the way to go! Raise your hand if you’ve had a very difficult week and really, really need to leave it all behind and unwind. Since time is really limited here, you don’t want to spend all of it traveling to your location. We try and find easily accessible places. This allows us to either drive to or book a direct, short flight. A bonus is if we find a flight out of our local airport that’s only 20 minutes away instead of the usual hour. We prefer carry-on luggage and places where we can pack quickly. With the kids along, no need to pack lots of nice outfits, so a casual atmosphere is really important. During the winter, warm weather and beaches top our list. These trips are so easy to pack and everything fits into our carry-ons. Skiing vacations, on the other hand, require a lot more luggage an work best if we can drive or get a direct flight. When bringing the kids, the cost for a 3-day quick family getaway is an important factor and the benefits have to be weighed against the cost. We prefer keeping the costs down by searching for all-inclusives and package deals when doing short trips. Driving certainly fits the bill, too. We tend to save the big dollars for our special vacations when we’ll want to eat great food and take equally great adventures. We’re generally just looking for a place to relax, have some fun, and de-stress on a quick family getaway. I like to know child care is available should my husband and I need a date night — and we probably do. Many hotels offer child care or you can find a local service. Just make sure you’ve done your due diligence ahead of time, and if it all possible, get a personal reference or referral from the concierge. Besides having a beach, I like to know there are things we can do as a family and that will keep the kids from getting bored. Sarasota is one getaway spot that has it all for us. From the beach to spring training to the polo grounds to an aquatic center, we never lack for great things to do. It’s also important that these activities are close by, so we’re not spending all of our precious time in a car. It helps if I have some idea of where to go and avoid a search from scratch. I always keep a list of warm and cold weather hotels/resorts that I know fit my criteria for a quick family getaway. It also helps if you’ve been a regular at any of these destinations as there may always be “room at the inn” so to speak, if they know you. I know there are really good travel sites out there with great last minute deals and people swear by them. But I’m still old school and love my travel agent. I can call her at the last minute and say my family wants to get away for the weekend. She can either make recommendations or get me booked where I want to go. All I have to do is pack. She can often get me in places I might not be able to and always has great suggestions for my little escapes. She essentially does my research for me. 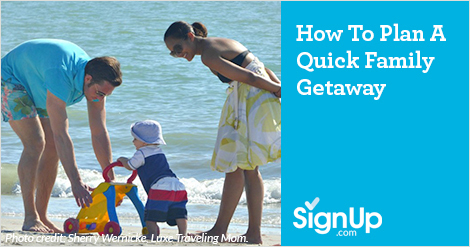 Find other great traveling tips and ideas on TravelingMom.com!